Apple has Siri. Microsoft has Cortana. Google has Google Now. 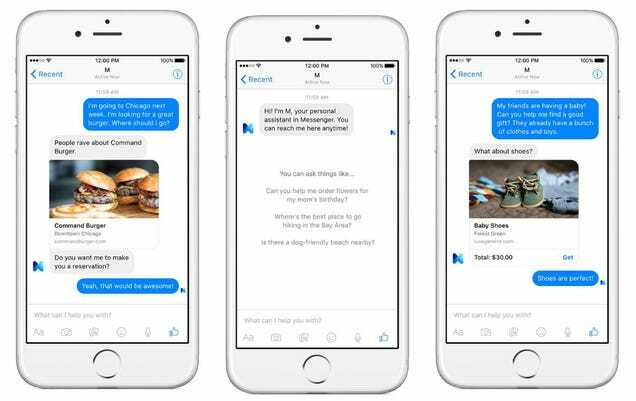 Now, Facebook is hopping on the AI assistant bandwagon with M. M is a personal assistant baked right into Messenger that serves up information when you ask for it. Not only can M go the extra mile and actually do things for you, being inside Messenger means it’s easy to just type out your responses instead of speaking at your smartphone like a goon. What’s also interesting is the emphasis Marcus puts on “being trained and supervised” by real people. According to Wired, you use M by tapping the icon within Messenger (much like any other normal contact) and asking questions. You’ll be answered by AI or possibly a real person—and you won’t necessarily know which one. It can also be both, with a human stepping in to complete more complicated tasks where AI might fail. It’s possible that the service will one day be able to handle all the tasks by itself, but for now, it’s a team effort. M will also ask follow up question to your queries and keep you updated on their progress. You know, like an assistant. For now, “M” is only available for a few select SF testers and there’s no timeline yet for its wider rollout. But Facebook has an interesting idea here—a personal assistant that can actually assist rather than simply answer questions.